Classes should be open for extension but closed for modification. Lets take an example to understand this better. Lets say you have opened a Pizza shop and you offer various types of Pizzas. you would probably create an interface Pizza and then make concrete class like PaneerPizza, ChickenPizza by implementing Pizza interface. But now lets say your business grows and you offer various types of toppings like extra cheese or mushrooms or spicy chicken or corn. For this you will have to now either create new concrete Pizzas or alter existing code. 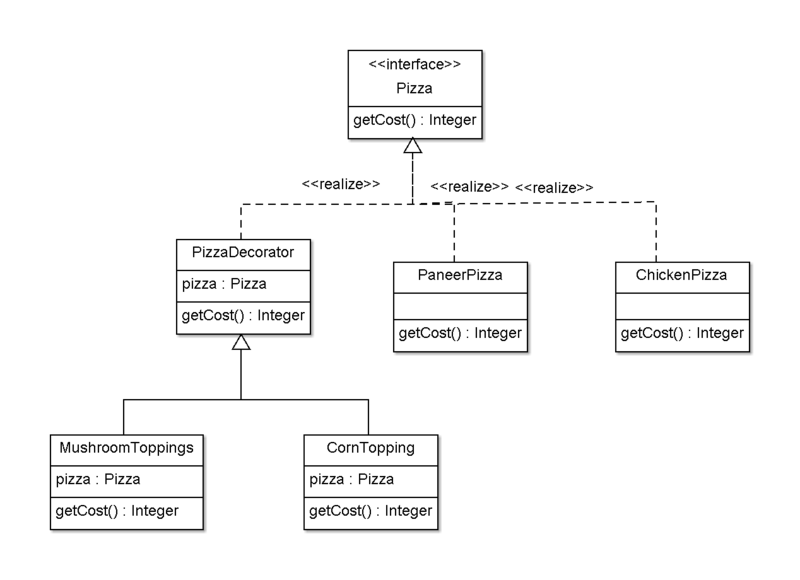 But this is not practical as every time you decide to offer or remove a new topping you code will change (Think of each Pizza having a getCost() method which will differ with toppings). This is where Decorator pattern comes to the rescue. Lets first create an interface - Pizza. And now lets create decorator class. Remember decorator class will implement Component and will also have an instance of Component in it. Also the operation method which is this case is getCost() will be abstract. and now lets create concrete classes for Toppings which will extend PizzaDecorato. Now go back to each Pizza and Topping class and verify the output. It's pretty straight forward. See how we could dynamically add toppings and compute total cost without actually modifying the original class? That the power of Adapter patter. NOTE : In decorator pattern decorator implements the component and also composes the component. NOTE : In adapter pattern adapter implements the target and composes the adaptee.